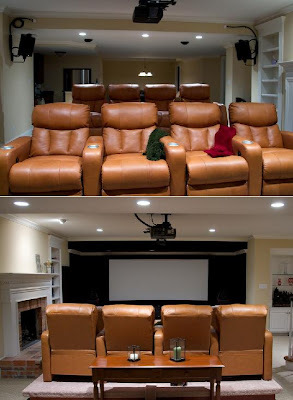 There's nothing like relaxing in your own home and enjoying a good movie with friends and family in the comfort of your own home theater system. 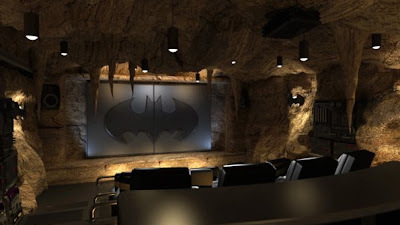 This Batcave themed home theater is custom done by Canadian-based firm Elite Home Theater Seating for a client. 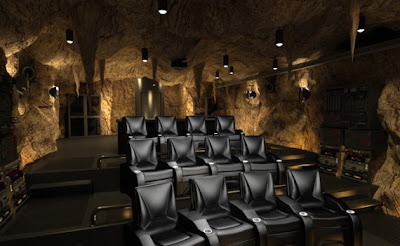 This theater reportedly costs $500,000 for the layout and seating alone; the equipment cost is additional. 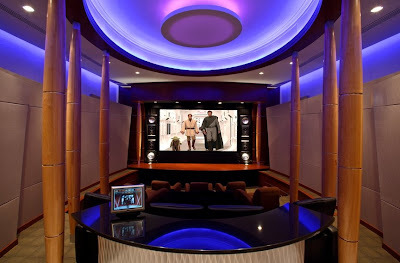 If money isn't a factor to be considered then this is something worth owning: a $6 million home theater - Kipnis Studio Standard for an ultimate home theater experience. 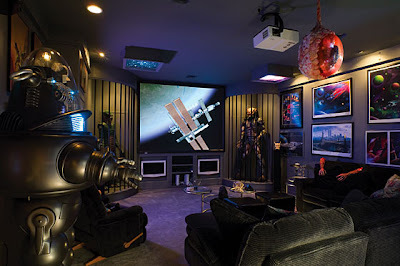 And if you want to know how it feels, then you might just want to talk to Jeremy Kipnis who surely knows his entertainment & has spared no expense in creating this one of the most expensive home theater systems. 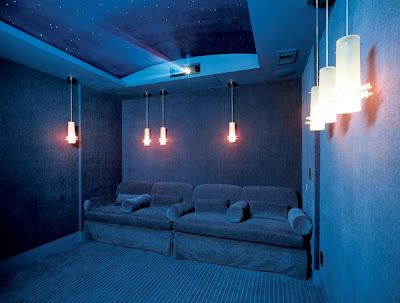 It's a custom built underground (basement) home theater and it comes complete with concession stand, marquee, and box office. 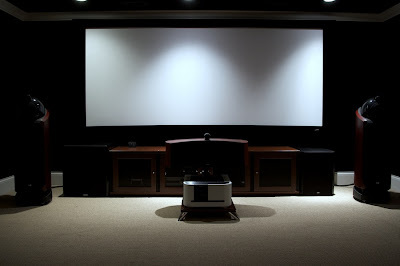 Three DVD players, a JVC QX-1 projector, and 25hz woofer drivers in Dunlavy SC-ivs are the equipment used. 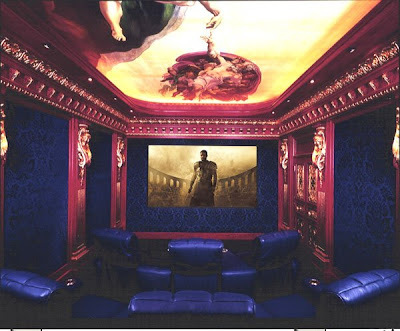 "Vault" home theater is created by Connected Technologies, it includes a huge bank vault door, cherry wood accents, mural, and comfortable seating. 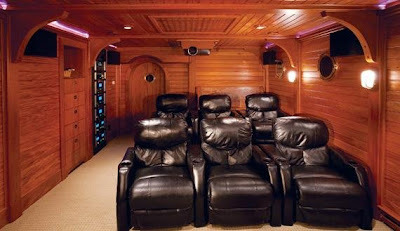 Home theater expert Doug Charrois designed this for Larry and Colleen Halliday. 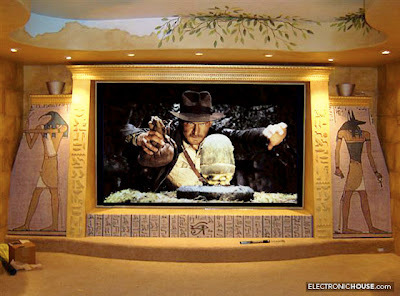 Enter the 18-by-12-foot home theater and you'll see the idol from the opening of the original movie, apart from many more articles that include jacket, hat and more. 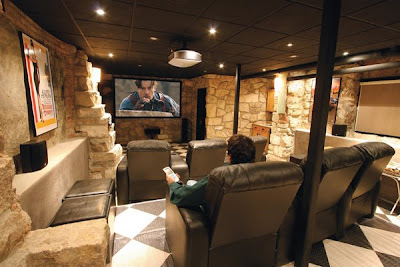 Marc and his wife Jody built their home from the ground up, and had designed the basement to be amenable to an entertainment complex from the get-go. 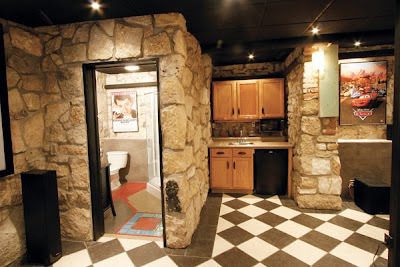 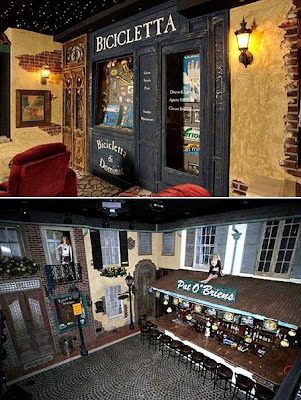 And when Marc was researching for their theater design in early 2006, he came across many fellow DIYers who gave their theaters a theme and it was at that time he came up with 'Irish Flavor'. 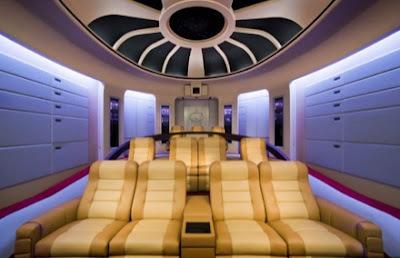 This home theater is modeled after 'The Next Generation' Enterprise, and the results are impressive. 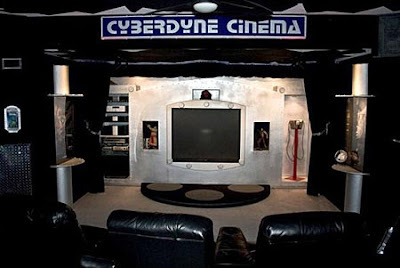 It was named the best theme theater installation at Custom Electronic Design and Installation Association 2007. 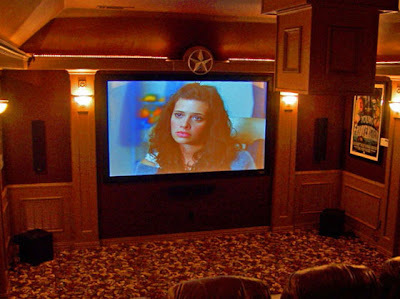 The home theater installation in Palm Beach County, Florida has projection screen which is nearly 135 inches wide diagonally, apart from this it has eight servers with 3,816 DVDs. 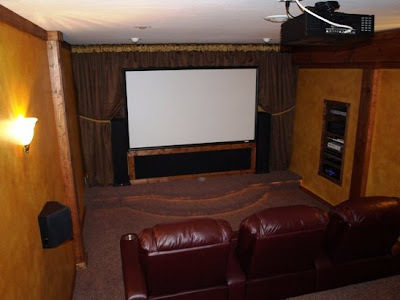 Gary Reighn had always yearned for that "big screen" experience in his home and he decided to make one for himself. 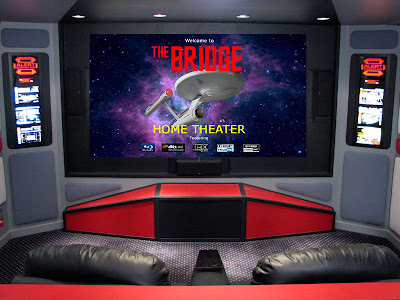 He came up with this 'The Bridge' with a modest budget of $16,000 and two years of effort from start to finish of this home theater. 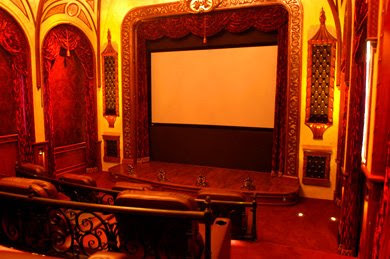 It's said to be 'one of the most distinctive, technically and structurally advanced private theaters in the United States'. 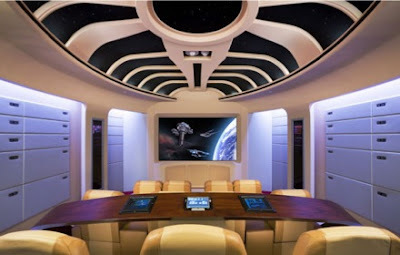 The highly detailed Star Trek-themed architecture includes motorized sliding doors, intelligent concert-type lighting and related DMX512 controls, and commercial-level HVAC. 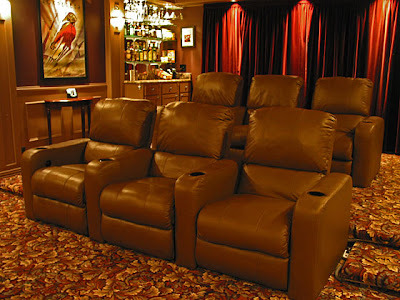 Tony and Penny Caciolo planned out their home theater setup into their Coopersburg, PA, home; they wanted it to be their favorite place: Italy. 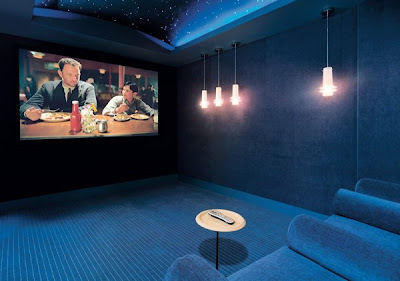 In the basement there's also a Bourbon Street Room that has a 170-inch screen. 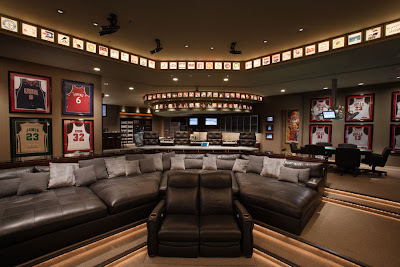 Apart from this there is also a 110-inch drop-down screen and a 1080p projector in his bedroom and the 20-foot screen on the side of the house for pool viewing. 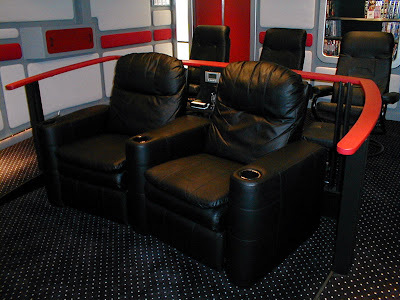 Terry Williams spent about $25,000, with equipment accounting for about $12,000. 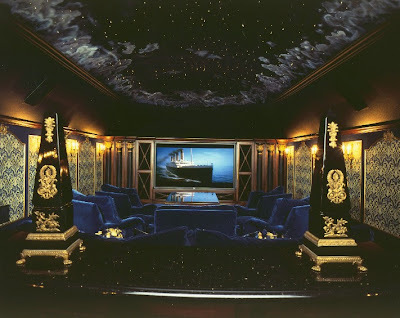 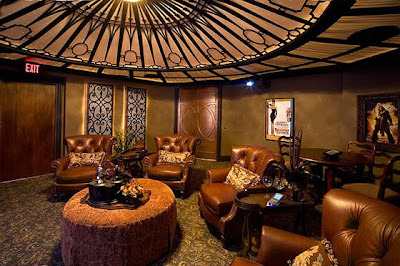 The elaborate dome of this 20-by-14-foot room was modeled after the ship from the movie "Titanic" for a Tennessee couple for their high-end home theater. 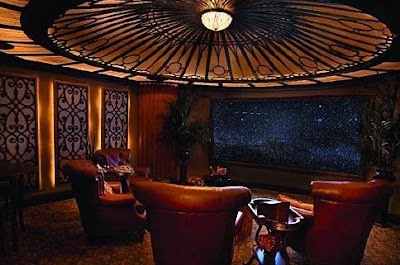 The dome contains 1,230 fiber-optic light strands to give the effect of the night sky. 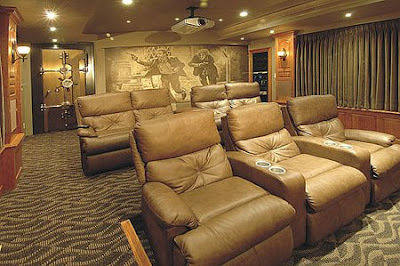 Interior designer Donny Hackett of Casa Cinema Design designed this project. 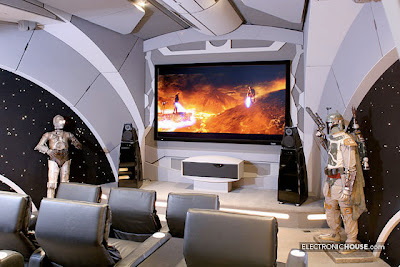 Doug Chiang (lead designer on Episode I and Episode II) designed the Deathstar home theater for Vic Wertz and Lisa Stevens. 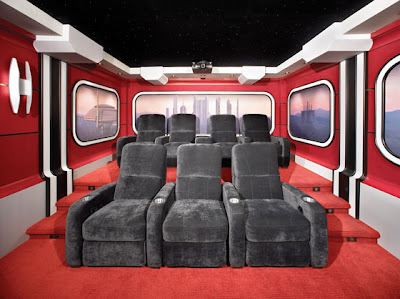 Its features include three levels of seats, a stage for the screen, and a fiber-optic starfield. 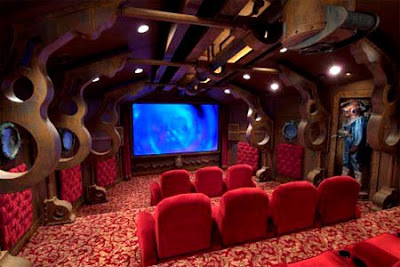 At first glance, this may look like a set from the film 20,000 Leagues Under the Sea, but the fact is it's actually a masterfully built home theater created for R Moran and his wife Brenda. 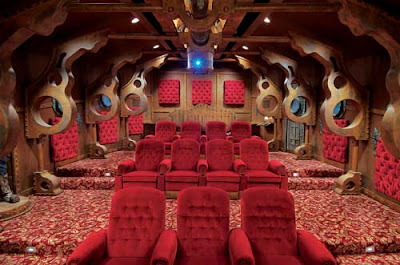 The Dallas based dentist and his wife weren't contented merely collecting small-scale replicas of the Nautilus. 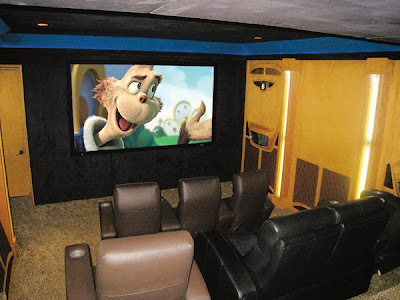 And finally they got what they wanted; this home theater is nearly 900 square feet and is shaped like a football with narrow ends and a wide center, and its Dillon Works Inc. who designed and assembled the decorative theater elements. 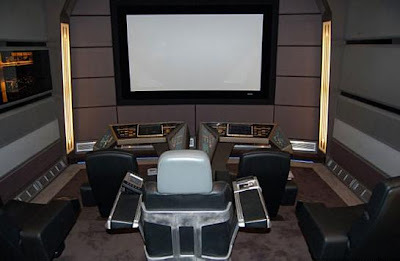 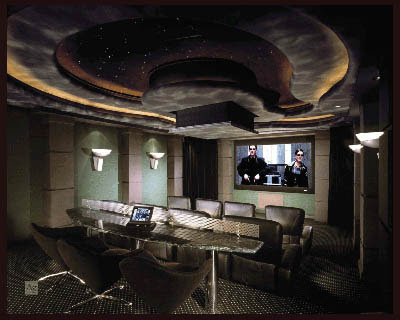 A client approached Genesisaudio and requested a home theater based on the movie The Matrix. 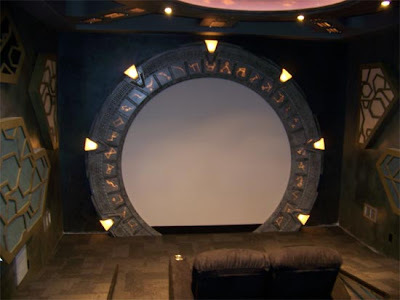 To get the concept, they studied the movie's settings and visual themes. 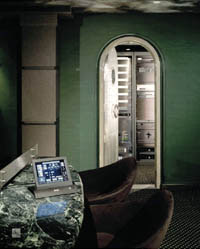 And a color scheme primarily made up of greens and blacks to complement the technology that was installed. 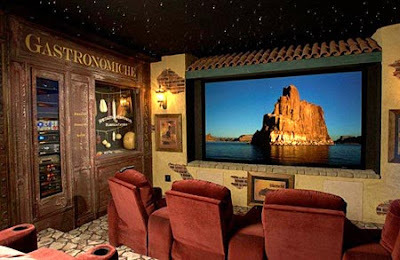 When Konolds' came up with this idea, it wasn't to pay any tribute to the Caribbean movie; when they were building their themed home theatre, they were simply trying to recreate the experience of the original ride at Disneyland. 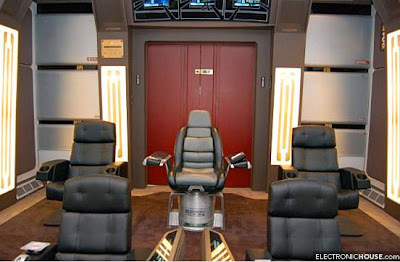 'The design incorporates a few things from the movie trilogy, but most of his ideas actually came from the experience of the ride.' 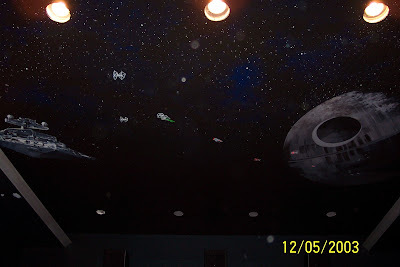 The theatre features a 16:9 screen with a custom masking system to make the setup 2.35:1 (the format of all Disney movies). 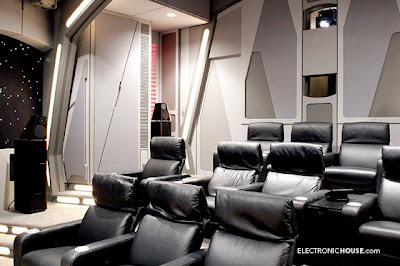 'This tribute to Sci-Fi may not be the biggest home theater, but the animatronics will have you jumping out of your seat - literally.' 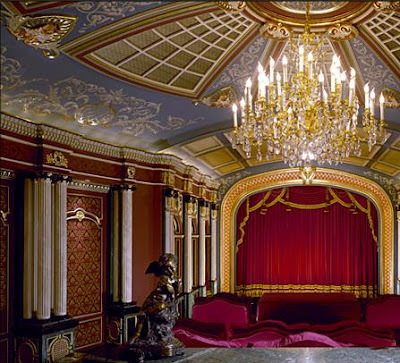 The theatre, including all collectibles and equipment, cost less than $100,000. 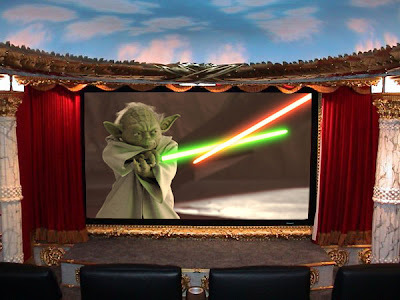 The Jedi Theater, a "Starwars" themed theater, 11 ft wide screen and 7.1 Surround Sound! 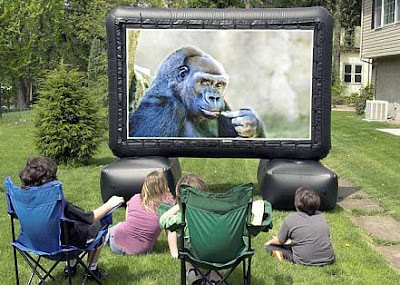 The inflatable home theater screen is made of PVC frame; it includes two 120-watt amplified speakers to provide the surround sound experience. 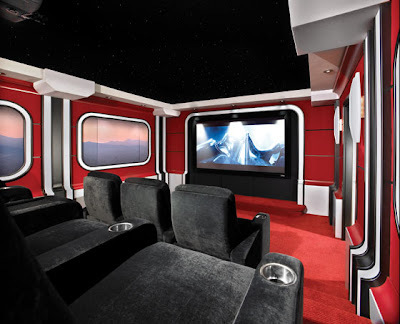 The 12-foot model is priced at $1299.99 and the 8-foot model sells for $899.99. 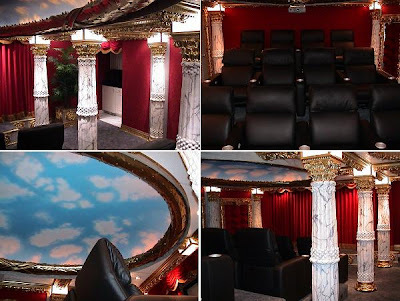 In this classic theater, ten people can watch its massive 60-by-111-inch projection screen. 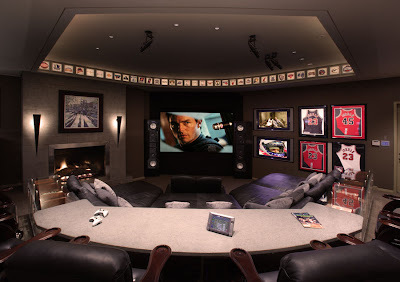 HomeTronics: 'An Experienced Team of Design and Installation Professionals Dedicated to Designing and Installing World Class Home Theaters, Audio/Video, Lighting, Control and Home Automation Systems.' 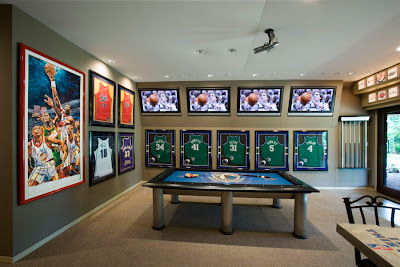 Here are a selected few from their gallery.